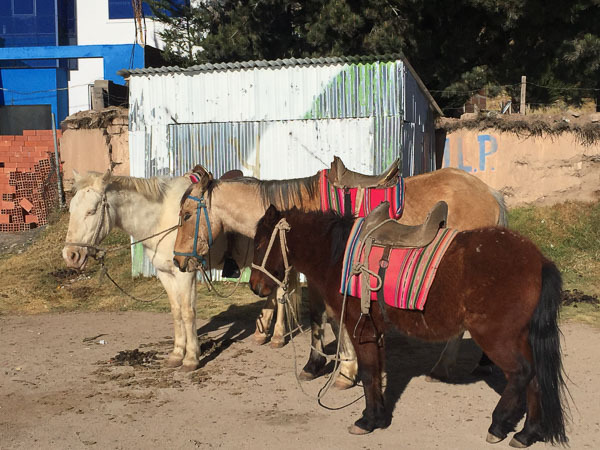 Blame it on El Papa: Misadventures in La Paz — 2checkingout | travel and adventure | Inspiring. Capturing. Experiencing. The flight into La Paz on a cloudless day offers stunning views of the world's highest capital. Rugged mountains to either side of the plane with the city clinging at a seemly impossible angle. The airport sits high at over 4,000 metres. The drive into the city drops nearly 700m down a long winding expressway. Along the route, when we arrived were teams of busy bees. Some planting new flower beds, some trimming trees, some covering graffiti, and others fixing the holes in road. Somebody important is coming to town, and it's not us. During the few days that we were in town, many hundreds of thousands of dollars were being spent sprucing the place up. All this for a four-hour visit from the Pope. 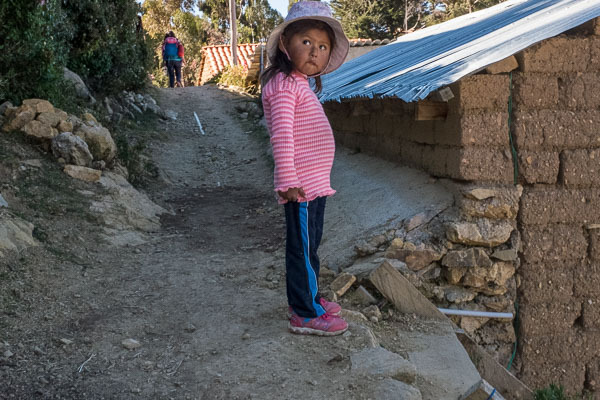 This papal tour to South America focused on the poorer countries. The irony is that these countries spend millions of dollars to accommodate the visitor and become a whole lot poorer in the process. Then, of course, you could argue they became a whole lot richer spiritually. For our stay in La Paz, we booked an AirBnB apartment. The owner of the apartment is one of the lucky few with a ticket to a special mass given by the Pope. Our BFF travel mate T Rex also joined us for a few days. Well, eventually. Her flight was cancelled and she had to take an overnight bus from Sucre. The poor wee thing arrived a very tired little bunny early in the morning. Wandering the main downtown area we found one little lane, Calle Tarija, with several good bars and cafes. One, The English Pub was packed to rafters for the final of the Copa America. We managed to bag a comfy sofa and with beers in hand cheered on Chile to victory. Gooooooooool! The lane is also home to a great little Mexican restaurant called La Cueva. So good we visited three nights running. 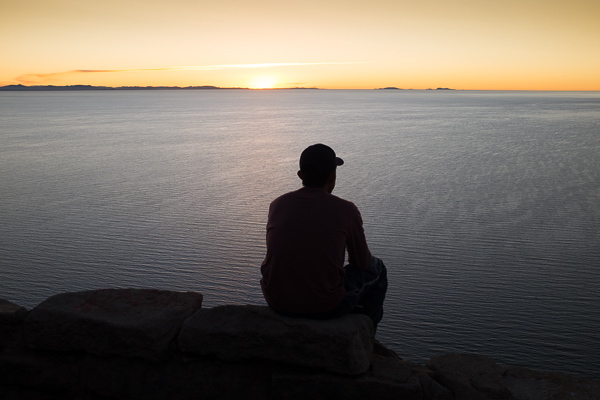 One of the must do activities whilst in La Paz is ‘The World's Most Dangerous Road’. We had booked in with Gravity Bolivia to bike the 63 kilometres known by locals as 'Camino de la Muerte' or Death Road to us. Before a new road was built an estimated 200-300 people were killed each year. More than justifying the name. There are parts of the road with 1,000 metre (3,300 feet) sheer drops on one side and mountain overhangs on the other. Since 1998, eighteen cyclists have died. And this is one of the top 'must do's' when travelling through Bolivia. Go figure. Our first attempt was on Friday. We rocked up at the appointed time only to find that the group had left an hour earlier. The police had closed all the roads out of La Paz for a practice run of the Pope's arrival. A mix up with our Gravity booking meant nobody had bothered to inform of the change. Take two was on Monday. We again climbed out of bed at 5.00am and walked down to the meeting location. This time there were several people waiting, phew. Just minutes before the departure time a member of staff informed us that there was an itsy bitsy issue. The local villagers were protesting over some taxes and had blockaded the road. There would be no ride today. We were told that these things tend to blow over in a few hours and tomorrow should be good. Take three, once again the alarm woke us from a dream laden sleep. Gravity had been keeping us updated via email the day before and nothing had come through this morning. A quick breakfast and we dressed and ready for action. One last check of the email before leaving. DOH. There it was. The blockade was still on, and again there would be no ride today. Well, at least this time we didn't make the 20 minute walk into the centre. Back to bed. After three attempts and running short on time we decided to pull the plug. Clearly, somebody was trying to tell us that riding The World's Most Dangerous Road was not meant to be. Around the corner from where the Pope would be holding mass, is the witches market, El Mercado de las Brujas. Holes in the walls acting as market stalls. Llama foetuses and dried newborns llamas the hot speciality. These are used for offerings to the goddess Pachamama and buried under Bolivian houses. Not sure how NZ bio control would feel if these were in our carry on luggage. Down from the market are quite a few clothing stores. On the lookout for a warmer jacket, I ended up looking after a stall for 40 minutes whilst the owner went off to check the warehouse for my size. With my beginners, Spanish I didn't manage to get anyone to buy but I also didn't lose any stock. Unfortunately, the North Face factory that these jackets came from made only one size regardless of the label. On the Saturday, the weather turned chilly and snow started to fall. Great time to crank up the heater and watch some crap TV. One of the benefits of an Air BnB apartment. Our sight seeing tour of La Paz was courtesy of the cable car system (Teleferico) that criss-crosses the city. Opened in 2014 and with over 10 kilometres of cable it's the longest system in the world. 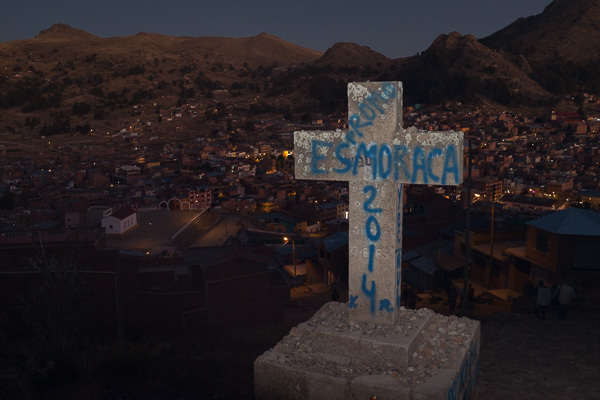 With Trush we took the Teleferico up to El Alto which offers spectacular views of the city. Then we crossed to the other side of town and mooched through a shopping centre. The cable car gives you a bird's eye view into the rich and poor areas of La Paz. The poor areas far out numbering the more affluent ones. 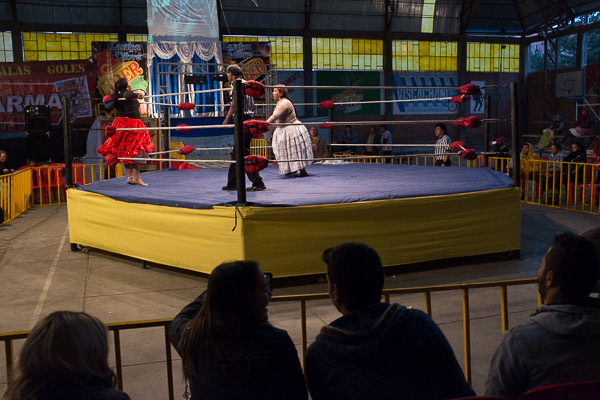 One of Julie's highlights was the Cholita Wrestling. The three of us booked into what promised to be an evening of cultural entertainment. Yeah right. Transported in the world's oldest bus to a seedy part of town. The venue turned out to be a partially covered high school basketball court. For the next two hours, we shivered our butts off as women in national dress wrestled each other. There was even one bout between two tag teams of men and women. The VIP seats (white plastic chairs) around the ring reserved for the tourists. The rowdy locals crowded together on the concrete bleachers. Before each bout, the wrestlers would dance around the ring providing photo opportunities. The evening brought memories of World of Sport on Saturday afternoons. Big Daddy, Giant Haystacks and Mick MacManus. 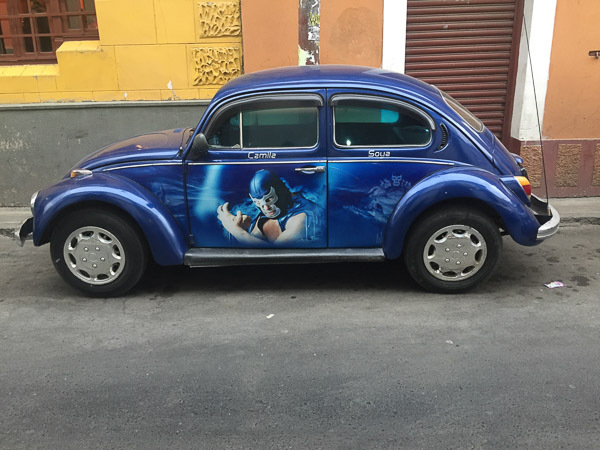 Now, they were real wrestlers. Yeah right. For our last night, we returned to the lane of cafes and chose a veggie place. Food ordered we then asked for a beer. El Papa strikes again; all alcohol sales banned for the next 24 hours. To transport us from Bolivia to Peru, we had chosen a company called Bolivia Hop. Set up by two Irish backpackers this company provides an easy to use bus service for travellers. We booked to travel from La Paz through to Lima, via Cusco. The service gives you the option of hopping on and off at certain towns and cities. 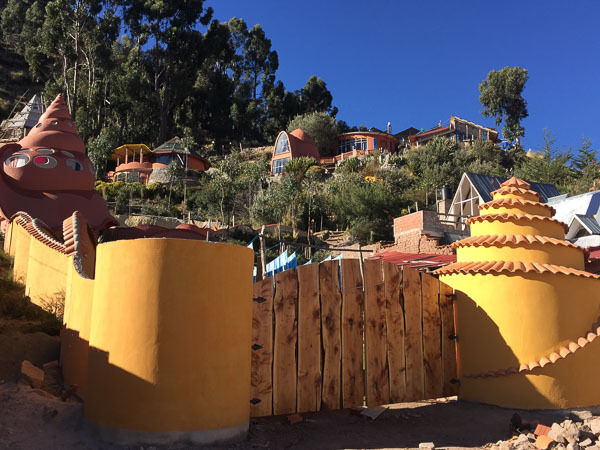 Our first stop was Copacabana on Lake Titicaca. With El Papa arriving our departure time was brought forward from 6.30am to 4.30am. WHAT? We had to be out of the city before they started closing off the roads for the day. Each Bolivia Hop bus comes with a guide, this first one was far too energetic and lively for the ungodly hour. And the bus was blooming freezing, so much so that duvets were provided. With a beanie, gloves, three layers of clothing and a duvet we were still chilled to the bone. The highlight of the trip to Copacabana came when we had to get off the bus and jump on a small boat to cross part of Lake Titicaca. The bus travelled over on a separate barge. Copacabana is a small lakeside town with a great laid back feel to it. We stayed at a wonderful guest house with a Mediterranean look to the rooms. Only trouble is that the nights were incredibly cold. So much so that we had not one but four water bottles to warm up the bed. The day we arrived was a public holiday due to ???? 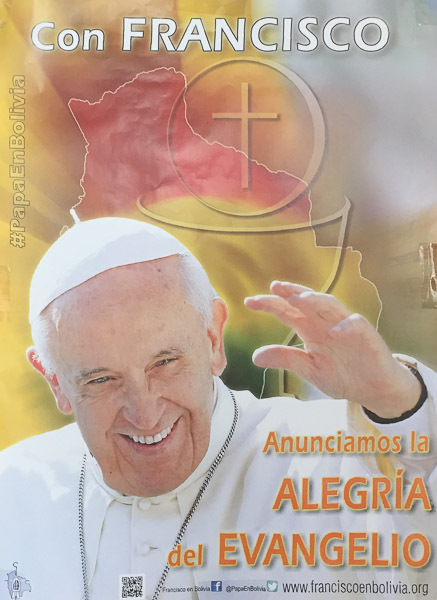 You guessed it, the arrival of El Papa in Bolivia. So the town was busy with families picnicking and enjoying the beach. We found a bar with a roof top terrace serving two for one Mojitos and watched the world go by. I booked a trip to Isla de Sol which according to the Incas is the birthplace of the sun. A couple of hours crossing Lake Titicaca, then a couple of hours walking across the island and then back again. It was an OK excursion for the price (US$10) with some stunning views but not much else to write home about. Behind our guest house was a walk to the proverbial hill over looking the town and the lake. The walk at altitude was slow going and reached a height of over 4,000 metres. This walk had the heart beating as wildly as Animal from The Muppets. The sunset however made the struggle worthwhile. So our time in Bolivia came to an end. La Paz is an interesting city. Somebody once said it has the hustle and bustle of an Asian city but with the convenience of an American city. Not sure about that but it was surely the busiest city we had been in during our stay in South America. Also being in town whilst they proudly prepared for the Pope added a certain something. La Paz has a reputation for being a dangerous city. Sure, in some parts it is not recommended to wander with a map in hand. But we found that with sensible precautions it was an interesting place to explore. Missing out on Death Road was a huge disappointment. Sometimes things are not meant to be. On to Peru.